Internally displaced people line up to receive aid in Bamenda, April 3, 2019. Cameroon officials say the number of people displaced by the separatist war in the English-speaking regions has plummeted, indicating the government is winning the conflict. However, nongovernmental organizations say the number has remained steady at a half-million, with a huge majority living in desperate conditions. At the Cathedral Hall of the Roman Catholic Church in Bamenda, Christians sing as they receive 35 people who fled clashes last Monday between the military and separatist fighters in the town of Kumbo. "We were caught inside the crossfire," Joseph Mussa told VOA. He says he escaped with his wife and six children after they had counted 11 corpses within a week..
"Luckily for us we know some bush roads, bush tracks. We had to find our way across the bush and streams, even spending some nights in the bush, and we find ourselves in Bamenda where we are crowded in small narrow room," he said. Last week, the Catholic diocese of Kumbo said it had documented evidence that 385 civilians were killed and 750 houses torched within seven months in Kumbo alone, and young people had deserted most villages, leaving only the very old. Cameroon's territorial administration minister, Paul Atanga Nji, speaks during a news conference in Yaounde, April 4, 2019. Paul Atanga Nji, Cameroon's territorial administration minister, says the situation in the northwest and southwest regions has improved greatly, and the number of internally displaced people has dropped 70 percent from its peak of 500,000 early last year. "Statistics from administrative authorities and NGOs working in close collaboration with the government show there are about 152,000 internally displaced in the two regions," he said. "Inflating the number presents another danger which can even jeopardize the sovereignty of the state." Atanga Nji said the government has supplied humanitarian aid to 100,000 of the displaced and will eventually reach the other 50,000 living in hard-to-access areas. 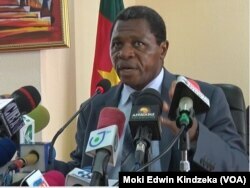 He dismissed as unfounded local media reports that the aid cannot reach everyone in need because of continued clashes between the military and English-speaking separatists who seek to break away from Cameroon and its French-speaking majority. 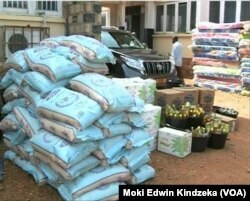 Piles of food aid, left, and mattresses, right, are distributed to internally displaced people in the English-speaking town of Bamenda, April 3, 2019. But NGOs have contested the government's figures. "We have 600,000 and above, and the U.N. says it is 500,000 and above, and all credible organizations are above the 500,000 mark, and these are professional organizations, which have a history of doing such a job [gathering statistics]," said lawyer Agbor Balla, founder and executive director of the Center for Human Rights and Democracy in Africa. "But being as it may, the focus is to ensure that the necessary aid, food and non-food items are provided to those who are internally displaced." He says Atanga Nji's figures are politically motivated, and designed to show the government is resolving the crisis.